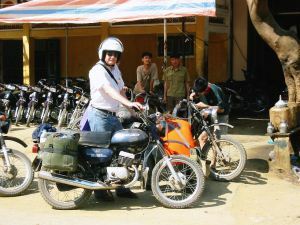 My motorcycle adventure was so incredible that it is hard to put it into words. There was so much to appreciate. At one level, there was the great conversations, good food and drink, and the graciousness of our guides and hosts when we stopped each night for dinner. For me, getting to know my fellow travellers is an important part of a holiday, and these people were easy to get to know. At another level was the stunning scenery that simply made me want to yell, 'Yahoo', as I rounded a turn and saw yet another beautiful valley, a mountain range, a blue green lake, a sweeping panorama, or a village tucked high up in the mountains. At still another level was the opportunity to do strange things in a different country that I have never done before. Take a long boat filled with bikes and people across a lake? Why not? Sleep and eat in a stilt house located in the middle of nowhere? I think I'll try that! At still another level was the intimacy I was able to achieve with the people and countryside by riding a motorcycle. Touring in an air conditioned van is like watching TV, divorced from the world outside. Riding the bike put me in touch with the sights, the smells, the sounds; a very tight connection with the world. And, riding a bike used by the locals somehow made it easier to connect with the Vietnamese people we met on our trip. Part of the beauty of this trip was the escape from the regularly travelled tourist routes, no one selling trinkets, no one hawking doodads for my shelf at home, no one assuming I am a rich American who can buy anything. We went to some remote parts of Vietnam. If you expect a four or five star hotel in the remote parts of Vietnam, then this trip is not for you. If you are willing to live with 'basic and clean' then there is much adventure to be had. Finally, Explore Indochina designed this trip with just the right mix of sights and activities. We had lots of challenging terrain to ride that matched our abilities, but not so much that we had time for nothing else. We had plenty of beautiful scenery, but rather than being the focus of our journey, was an integral part of the trip. The places that we ate, drank, and slept were an integral part of the experience, not a time out from the day's activities. The end of any given day would find me tired but joyful. I can't wait to do it again.